Cell phones have become part of a standard and an accessory in almost everyone’s lives. We depend on it to communicate everyday. However when do cell phones become a distraction rather than an attraction? Should cell phones be accepted into only certain areas? In libraries there are designated areas for chatting, in most hospitals cell phones are not permitted and gas stations have placed warnings of the danger of cell phone use. With all these warnings and restrictions, should restaurants follow? Our need to stay in constant touch with friends, family and co-workers is an obsession that has become a public distraction. Public cell phone chatter has spilled over to weddings, funerals, theaters, sporting events and restaurants. The need for cell phones is at the highest level of obsession with the availability of cell phone in airplanes and Bluetooth technology enabling hands free capability. With the rapid increase of the number of cell phone users, cell phone manners become more important. Renowned restauranteur, Danny Meyers states “cell phones have become so widespread that the entire etiquette aspect has been skipped over.” Meyer’s has placed signs in his restaurants that refrain guest from using their cell phones in the dining room. Other restaurateurs have completely banned the use of cell phones. Chicago chef and owner, Rick Bayless shared his opinion on the topic, “You would never catch me in a restaurant with a cell phone on the table. I go to restaurants to relax.” Although, his restaurant Topolobampo has printed the cell phone policy on the menu, he doesn’t enforce the rule unless it gets out of control. However, not all restaurants have banned cell phone use nor placed any restrictions. Ben Benson, owner of Ben Benson’s Steak House in New York City believes people are overreacting and don’t see it as a problem. As a restaurant customer himself, he admits to using his cell phone while dining. Cell phone use in restaurants should be kept at a minimum. Conversations should be kept private as no else needs to know all the details. Talking loudly and conversing for extending period of time is not only annoying but rude to other customers. Restaurants should encourage cell phone etiquette and place signs outside their door refraining customers to use their cell phone during dining service. Signs may not stop cell phone usage, but it can be a deterrent. Therefore, when a problem arises, restaurant owners have the right to address the situation. Banning cell phones is another option that some have taken, but may not be the best solution as it may turn business customers away. It comes down to reminding the customer where they are and to kindly take their conversation outside. Most customers will understand and will do as told. Implementing a cell phone policy for restaurant customers should also be applied to restaurant employees. It would be a double standard if you allowed your employees to converse on their cell phones in the public eye. Cell phones should be turned off prior to the start of work. Remember, employees are paid to work, not chat on the phone. The restaurant is a workplace, a professional environment. It is not a playground or a house. Set the rules in the beginning. 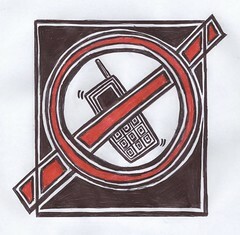 The best and most effective way to implement a cell phone policy is during training. I would be a hypocrite if I said that I despised all cell phone users in restaurants because I have been one of them. Rarely do you find me on extended conversations while dining with friends. If I have chosen to pick up the call, I do it because I have to and I have informed my guests ahead of time. In respect for my guests and other restaurant customers, I will always take a call outside. So like me, if you need to take a call you should excuse yourself from the table. Another point to keep mind, place your ringer on vibrate or silent. There’s nothing worst than having a loud ringer or tunes of a Britney Spears ringtone in the background. Keep your conversations to yourself, there’s no need to share it with the world. This entry was written by TheRestaurantBlogger and posted on May 23, 2008 at 7:00 am and filed under Restaurant Ramblings. Bookmark the permalink. Follow any comments here with the RSS feed for this post. Hm.. My restaurant prohibits the use of mobile phones during working hours. It’s really dangerous when the mobile rings while you are cooking! And I wish they’ll ban it in the dining areas too. Arghs!! Well now I feel bad. If I go to a restaurant alone, I like to check my email and read the net on my phone. But I wouldn’t talk on it inside. If people talk on their phones in public places, at least make it an interesting conversation because others are probably listening. I turn my cellphone on vibrate mode when in the dining area. It’s my way of being considerate of other people enjoying their meals, and also those I’m with. If I have to talk on the phone for longer than 10 seconds, I excuse myself from the table.